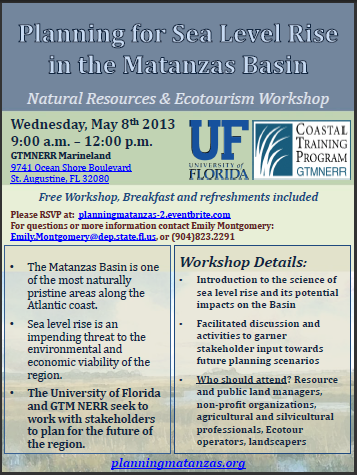 The first set of workshops for professional groups in the Matanzas area, including St. Augustine and Palm Coast, will be held in May and June at the GTM Research Reserve office in Marineland. The first workshop on May 8th, 9:00am-12:00pm, is designed for representatives of natural resource and ecotour businesses. 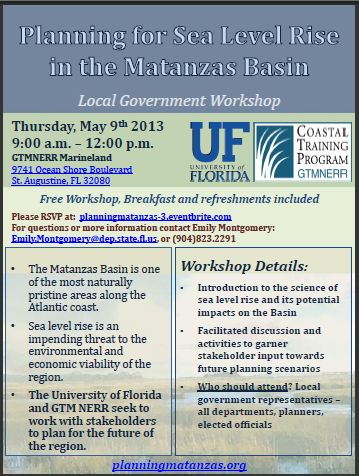 The second workshop on May 9th, 9:00am-12:00pm, is intended for local government officials and planners, and members of state and federal agencies with local interests. The third workshop on June 4th, 12:00-3:00pm, is geared towards urban developers, real estate professionals, and other business and economic development representatives. 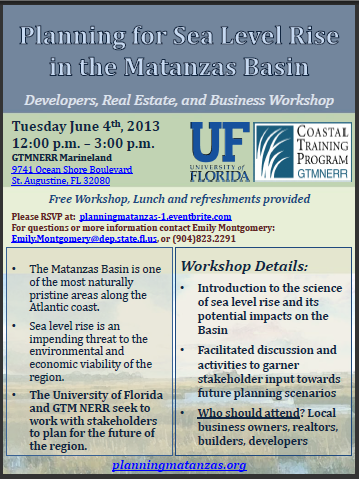 At each workshop, researchers from the University of Florida will present the science of sea level rise and its potential impacts on the Matanzas area. Workshop facilitators will ask participants for their preferences of what places to protect and what adaptation strategies to use. If you are a professional, please visit Events for specific information and to RSVP for the workshop that is the best fit and most convenient for you. Your participation is important for gaining awareness of important issues of coastal change and how they affect you, and for guiding integrated planning for community and environmental adaptation. This entry was posted in Uncategorized by Caitlin Cerame. Bookmark the permalink.